This entry was posted in Nick Mason by Doc. Bookmark the permalink. 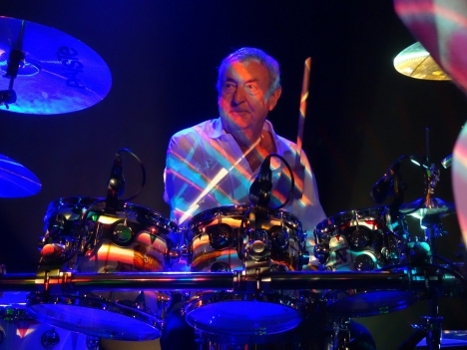 He tours England and Europe with his Saucerful of Secrets in September and expects to bring the group to America in 2019. That’s correct and I was well aware of it long before Rolling Stone was. Playing YNWA on Fearless at the Manchester gig will be fun. Can’t wait. Fantastic! Have a great time !! Funny how one of the members of Saucerful said the Floyd never played “See Emily Play” live. It’s one of the selections from the Stockholm ‘67 set on Cambridge St/ation. Eh. They’re musicians, not historians. I think they meant Nile Song. Either way really who cares! It’s a refreshing set list from any member of Pink Floyd. Holy cow, that’s amazing!! Thanks for sharing! Amazing show! Which one’s Pink? It literally brought tears to my eyes to hear this unusual selection. Amazing concert. Thank you doctor. Great sounding show, good job Matt! Single sweetest show ever played by a solo Floyd. So great that it happens to be Nick. He’s going to need to add some new chapters to his book. Simply incredible as well as unexpected. Thanks Nick & Doc. Love this! My new fave! Please bring this show to the States! Cool to hear it from ‘out front’. I must say I never thought I’d ever be featured on one of your podcasts. Has anyone noticed my quote from The Who’s Sparks from Tommy in Interstellar? We are really looking forward to September. Fantastic to hear from you Lee! You and the band sounded amazing and captured the early Pink Floyd sound remarkably well. Hopefully I can cross the pond for a gig. Any real chance for a tour in North America? I also heard a bit of The Embryo snuck in there? The sheer fidelity to the mad spirit of it all, along with the scope you give yourselves to do your own thing, is wondrous to hear. Indeed I did quote The Embryo very briefly! Thanks Mike. The last thing we or Nick would want is to have to replicate note for note. It’s more about the moment. Great set, great sound, and it is nice to have some lighter banter and proper jokes between some numbers. There are a few more long forgotten Pink Floyd rarities that could do with a robust treatment in being played live. What I don’t get is why the band did not get called ‘Nick Mason’s Relics’…..
My god, what a set! I hope Nick eventually brings this set to the states (and regrows that sweet biker mustache, too). Thanks Doc! you made my day. such a great concert. such an awfuly great idea of the great Nick to come out and play some music. i will see him in september in Hamburg and cannot wait for THAT, but i enjoy waiting for him, more than for Rog, who played two weeks ago. i really hope you have the chance to see Nick in the States or even in Europe. Thanks Doc. Thanks. What a treat! Thanks Doc, really hope you can make it to Copenhagen in September. Briliant stuff, thank you. Cannot wait for the o2 manchester its going to be cool. Thanks Doc! What an amazing sound! Hope they come to North America soon. Great sound. Thank you. Got a ticket for the Manchester gig. Buzzing.